No, it really is. When I heat up anything, and then close the door after I’ve taken the food or coffee out of it, it starts up again, but only for a few seconds, like maybe six total, and then stops. Do you think it’s the ghost of my old kitchen saying hello to me? Or is it mad about something? Or just trying to freak me out a little? Or do you not give a rat’s flying tootaloo bodiddly and want me to get to the potato salad already for the love? Because I think the ghost is probably upset that I got a new microwave after the remodel and wants to give me the bird. The electromagnetic radiation bird. BECAUSE IT’S THE ONLY THING THAT MAKES SENSE. Okay so I wanted some potato salad the other day. But the tidal wave of my soul lead me down a path of curiosity, which on any normal day is borderline hazardous for my life and anyone in nearby proximity. Because I didn’t want like, a REGULAR potato salad, with boiled potatoes and mayo and all that. Not that there’s aaaaanything wrong with it. I mean, I can totally dig on that kind. My mom makes it all the time with a little paprika on top. WAIT, do you think the microwave is trying to tell me it’s happy I bought it over the one I almost bought? Like, “You did the right thing, gurlfrin. kudos.” Or something like that? No? So I roasted the potatoes. I KNOW I KNOW, it’s summer and hot and I don’t wanna turn on my oven waaaaaah. BUT LISTEN, you’d have to boil water if you weren’t roasting! Which is just as hot, right? See, I wanted the roasted-y-ness of the potatoes because frankly it’s my jam. But I also wanted some crunchy texture all up in it, so in went some celery. AND, I also wanted to keep the whole thing kind of light and whimsical (because potato salad never gets that adjective), so I whisked together some olive oil, Greek yogurt and a TON of fresh lemon juice. Sweet baby kittens of magical poppy fields, I have seeeeeeeeeeeen the light. I HAVE EXORCIIIIIZED THE DEMONS. I know that doesn’t really make sense here but I just love her little voice when she says it. You guys, make this make make this make this make this. Oh ew, maybe I need to get an exorcist to look at my microwave. Great now I’m scared. Potato salad perfection. Truly. It looks simply amazing! Come to thing of it, MY MICROWAVE IS HAUNTED TOO! What do we do??? PS~ LOVE the tatters! I'm glad I'm not the only one with a possessed microwave… If I didn't rent my apartment that thing would have been out the door looking for a new house to haunt three years ago. I just pretend that its trying to have a conversation with me and not fry my brains every time I use it. On a happier note - Um, Holy Yum on the Tater Salad!! I have a few haunted kitchen appliances too - so weird! This potato salad looks crazy good, Bev!! This is the way potato salad should be made! Because it looks dreamy! I seriously love that pot! It's so rustic and cool and fits this salad so darn perfectly! Love me some taters and lemon and with yogurt...score. Mmmm...this recipe has a major yum factor! I'm thinking I need to make this tonight with the purple potatoes I just brought home :) Woo hoo, thanks!! Oooh how refreshing! And I love how this just screams summer! 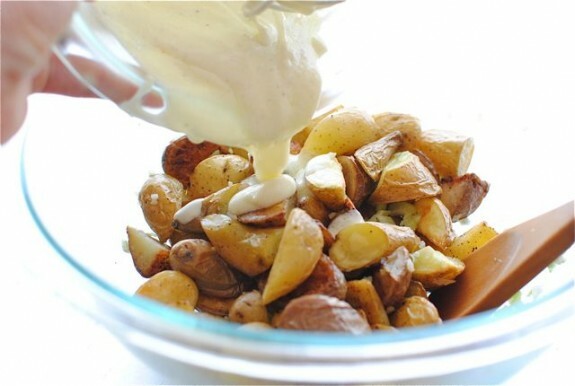 Great alternative to potato salad drenched in way to much mayo dressing! I am taking this recipe with me to the beach. You should really get that microwave checked out. I had a similar problem with a microwave in the past. It ended up coming alive at night and eating the face off my roommate. We severely punished it and it swore it would never do it again. Then, not a week later, it bit the tail of our dog! I'm telling you, those microwaves. They've got some discipline issues. You should probably take a baseball bat to it... 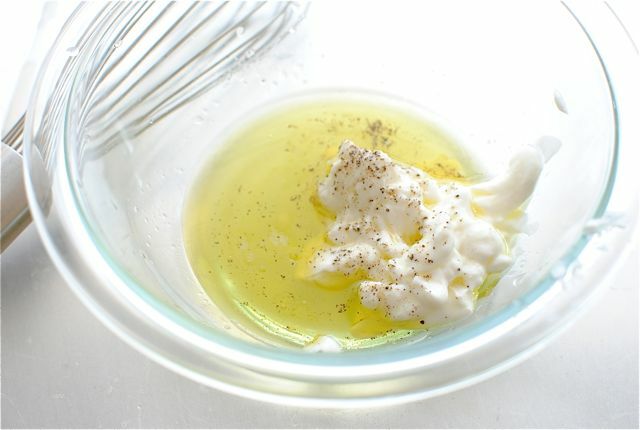 I'm loving the idea of yogurt and olive oil in a potato salad! 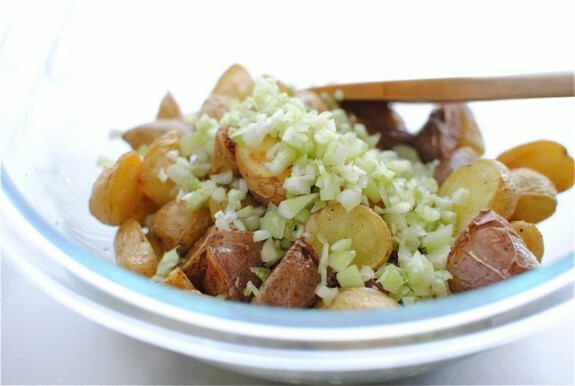 Yummy, love the look of this tater salad. Especially since you didn't put any mayo in it! Roast potatoes are one of the few things that it's always worth turning the oven on for no matter how hot it is. Especially when they're all lemony bright and delicious. Are you planning a cookbook? Because I pin pretty much everything you post... That was meant to sound less stalkerish and more food loverish. Perfect flavors for potato salad. Love the Greek yogurt. my mouth literally starting watering at the first picture. holy. feed me. My microwave sounds like it's trying to make dubstep music when I turn it on. You read my mind. I was just thinking I needed an interesting little potato salad to take to a bbq this weekend. My soul thanks you. I was just thinking about potato salad a couple of days ago and BAM! You made a stellar looking recipe that I must try now! Thank You! I will definitely be making this! Great idea to roast the potatoes first! 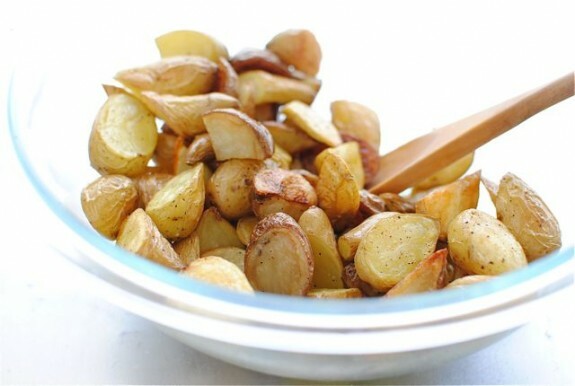 It's been a while since I've had roasted potatoes so this recipe looks verrrrrry appetizing! I especially love that you don't put mayo in it - I'm not at all a mayo person but love plain yogurt, so this is perfect for me! This looks Delish!!! and This post was Hilarious!! I have such a thing for Potato Salad and these pictures have me foaming at the mouth...in a completely good way, not the wow- she is Cray-Cray kind of way, lol! BOOKMARKED! 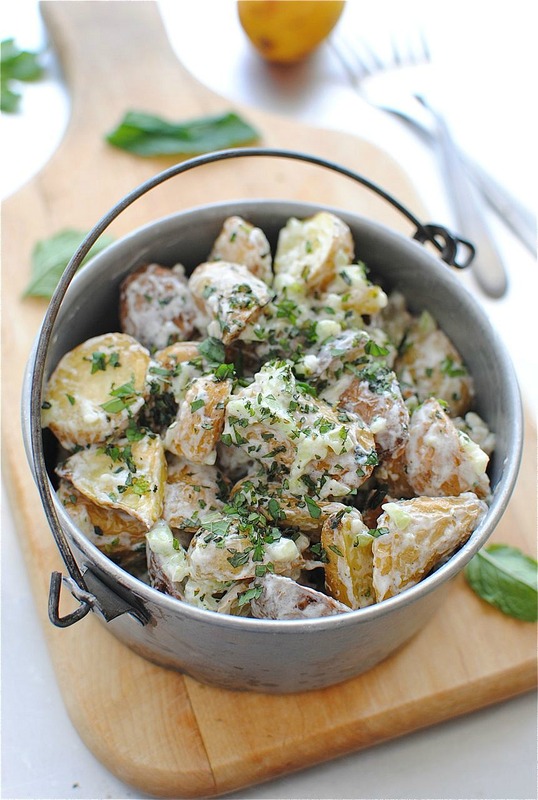 What and awesome way to spice up potato salad! Also, hope your microwave loses its ghost. That's just weird. I can definitely vouch for this one. It was D.E.licious. Thanks so much for sharing your yummy cooking. Gosh this looks JUST PERFECT. I'd love some in that fancy little pail you have there. i want that bucket delivered to me. by hand. I had a car that was cursed, so I totally believe in a haunted microwave. Bizarre? Yes. Unthinkable? No. (PS: next time you're feeling the roasted potatoes, throw those babies on the grill. I know you had something grilled with that potato salad. My husband works late a lot and I'm a total scaredy cat. Your microwave would freak me out! (I'm a little embarrassed to admit.) At least there'd be this potato salad to stress eat. It looks so, so delicious! This looks so awesome! 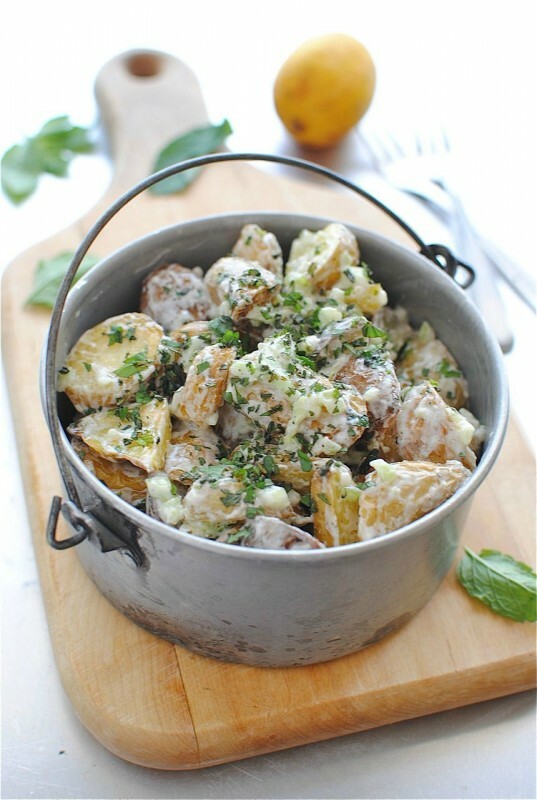 I love potato salad but never tried it with roasted potatoes. you are hilarious!! and the recipe looks good too! OMG, these look amazing. Too bad Curtis doesn't like potato salad...because when I make this...it will be all mine! My micro was doing the same. Electronics were going out. Door had to be changed. Potatoes look delicious!!! Your potato salad looks amazing and I will definitely be making this for mine and my wife's dinner tonight. But do yourself a favor--never microwave you coffee again. You'll love yourself more for it. I promise. I am sooo glad to hear this! Thanks so much for letting me know. And I'm absolutely adding those seasonings next time, hooooly. So glad to have seen this. I've been wondering about a roasted potato salad recipe myself. Will be making this next weekend. This potato salad is one of a kind. I am definitely going to make it this weekend with my grilled steak! Can't wait! Tried this for dinner tonight, it turned out great. I didn't have any mint on hand but had some fresh thyme from my garden that worked well with the other ingredients. Paired it with some grilled rosemary zucchini, and lemon caper salmon. 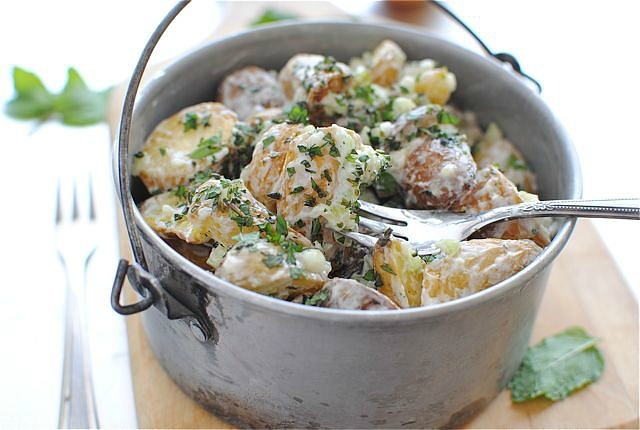 I generally don't love potato salad but I love roasted potatoes and anything with lemon I'm up for trying at least once. So I suppose this is going on the "to make" list. Thanks lady, looks amazing! Made this for my family tonight with steaks an summer squash off the grill. Everyone loved it-how refreshing! Love the mint! Thanks so much for sharing!! Sooo good! Great summer potato recipe! Made this but added in some onion and green onion! It is SO good! bright, lemony, tart, and just overall YUM. a very nice healthy alternative to regular potato salad! love the yogurt, lemon, green stuff going on. and your sense of humor :) I bet this would work well with cauliflower (my fave). Wow does this sound great! I love roasted potatoes, that's about the only way I eat them these days. I can't wait to try this tater salad! Thanks for the recipe. This looks delicious and all... But I really love that little pot you have your potato salad in!!! Just updated my shareaholic! I can't believe I didn't have Pinterest on there. Fixed and thank you! Just made this tonight. It's crazy delicious! I am just wondering how this recipe keeps because of the baked potato. I want to try this, but I am going on a camping adventure and would need to make it two days before hand. Worth trying, or should I save this for a day I can make and eat so the potato's keep stay crispy? Thank you! I have made this potato salad and it is good. I don't use 2 tbs of lemon I use one.. that's enough for me. The best part is you don't have to peel the potato's. My daughter is a vegetarian and she loves it. This salad is a must try recipe. Sounds like a great recipe, I'm gonna' try it. I just don't turn on the oven or boil water on the stove when it's this hot, so I'll scrub my potatoes clean (plastic dish scrubbies work great), rub them with olive oil (to keep skins moist) and either steam them in the microwave or grill them (do extras when grilling & tightly plastic-wrap when cool, use later). Re: the run-on I wouldn't call an Exorcist, but I would call an elecrical repair shop or buy a new microwave, 'cause what you're describing sounds like a short in the wiring- and shorts lead to fires! Rental or not, a new one is cheaper than a fire. To Jeannie (with lactose intolerance), fermented items like yoghurt, cheese (the harder, the better) & kefir have had much of their lactose (milk sugar) 'cracked' by the beneficial organisms that do the fermentation. My moderately lactose intolerant sister can get away with small amount of these items (1 item a day) with lactaid pills. Good luck. I have a vegetarian daughter who does not like mayo. This recipe is easy and so good, the only ingredient I do not include is the mint. We are not mint lover's. 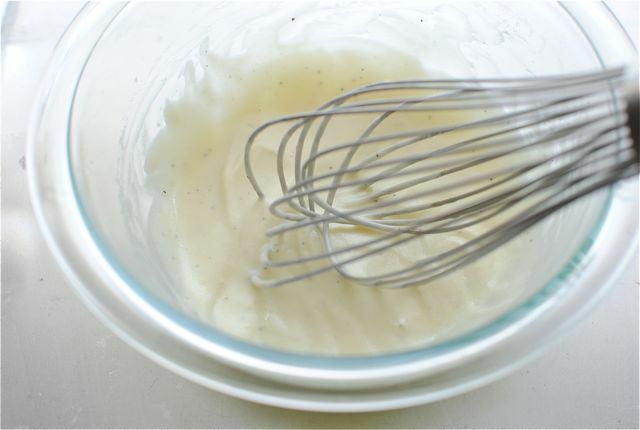 I only put in a 1- 1 1/2 tbs of lemon just our preference. My daughter can't get enough of it and I enjoy it also. I would suggest you give it a try. Hun, this is being made for my son's big 50 person wedding shower tomorrow! It spoke to me and I will serve it with my smoked BBQ and other good things to these guests. Will let you know how they weep for more of it! Do you think this is okay to prepare the day before serving? Should I just prepare the potatoes and the night before and then mix with the dressing immediately before serving? Or can I mix the night before? Thanks! Hey, Beth! You could definitely prepare this the day before! The potatoes might not have that super awesome freshly-roasted texture, but it will certainly be close. And yes - I'd toss with the dressing right before serving. Let me know how it turns out! Britain’s Hidden Child Abuse Ch4 30. January 2013Dispatches found 19 cases where crimes were not reported as the Orthodox Jewish community prefers to deal with it internally.Could someone please record it ? 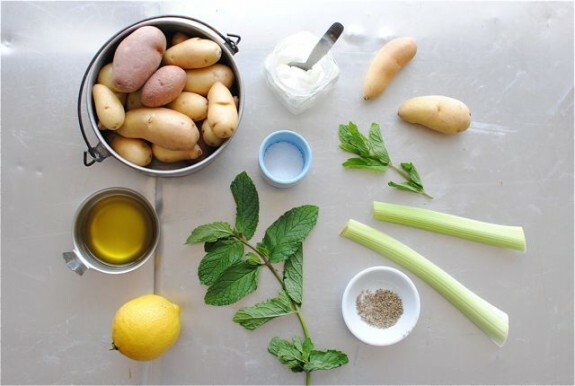 Baked small potatoes, celery, mint, olive oil, lemon, yogurt, salt and pepper and that's it? Sounds like a good start but my palate needs to be sated on multi levels of savory, tart alone don't get it. Girlie talk is so off-putting, but that's intentionally sissified to throw off any males who aren't hairdressers or decorators? Well it worked, all I wanted was a simple but complete 12 step plan that fits on an index card, no mayo, no hair parlor talk, so I will look elsewhere. Maybe the He-man Treehouse Food Club, No Girlz Aloud? You should try this recipe--it's great. I made this potato salad for our solar Eclipse Party. 32 people raved about this dish. I did forget the mint, though! This was legit. Whole family said best potato salad ever. Plus you can eat more because it's light!!! OH.MY.GOODNESS. This potato salad is B O M B! Many thanks for sharing this delightfully crispy, light and dare I say totally healthy twist on the perfect smoked pork accompaniment. Oh, and the mint...makes it. Great looking salad there, I will definitely try it.